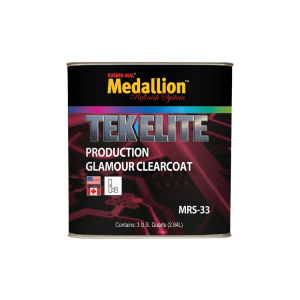 MRS-33 TEK ELITE Production Glamour Clearcoat is a fast-drying high solids clearcoat that has excellent gloss retention and D.O.I. It is formulated with innovative resins and UV stabilizers to provide a durable, long-lasting finish. MRS-33 TEK ELITE Production Glamour Clearcoat is ideal for spot or 1-2 panel refinishing and utilizes a variable speed catalyst system to provide consistent performance in a variety of weather conditions.